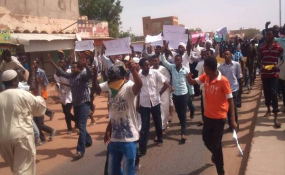 Sennar / El Giteina / Karima — Residents in Sennar, White Nile, Northern State and El Gezira have complained about the continued shortage of bread, fuel, and cash, leading to poverty. A number of people in Sennar state considered the government's claim of the availability of basic materials at reduced prices as "a lie". "We are still lining up in front of the bakeries to get the bread, as well as the fuel, and [are faced with a] liquidity crisis," a resident told Radio Dabanga. In White Nile, residents of Kombo Awadallah village in El Giteina locality have voiced similar complaints: there is a crisis of bread and cooking gas. The price of cylinder of cooking gas has amounted to SDG300 ($6.30*). Karima in Northern State has suffered from a severe drinking water shortage for six days, as a result of a break in the main water carrier. "The water has been cut off from the town since last Wednesday, until Monday, and people have been bringing water from far away areas," a listener told Radio Dabanga yesterday. He called on the authorities to expedite the repair of the carrier. In El Gezira state, farmers at El Jamousi irrigation department face a lack of irrigation water for their winter crops, especially wheat. Usually the farmers irrigate their crops through water pumps. The authorities have to urgently intervene, a farmer told this station, to address the situation which he described as "dire". Meanwhile President Omar Al Bashir has accused banks of manipulating usury limit and adopting a secular Western system in managing money. A usury limit provides that you cannot lend money at an interest rate in excess of a certain statutory maximum. Speaking at a two-day state visit to El Obeid in North Kordofan, the Sudanese president held a speech yesterday in which he accused bank managers, whom he did not name, of resisting and thwarting the microfinance experience by turning money into US Dollars and using them for marketing. He claimed that the results of usury limits in Sudanese banks are worse than any existing system of interest. Al Bashir issued an urgent call to cancel the added tax value on microfinance in banks, with interest rate not exceeding five per cent. The recent printing of new currency by the Central Bank of Sudan has been necessitated by hyperinflation, coupled with a chronic shortage of hard cash. Banks have limited cash withdrawals so traders and the public prefer to keep their cash at home, rather than deposit it into banks. Over the past few months, as the value of the Sudanese Pound has dropped steadily against the US Dollar. In December 2018, the Central Bank of Sudan issued a decision to set the limit of cash withdrawals by bank cards at ATMs at SDG 20,000 ($421) a month.